And she flatly rejected a fresh proposal from Brussels to try to resolve the row over the Irish border as “not credible”. “The onus is now on all of us to get this deal done,” the Prime Minister said. 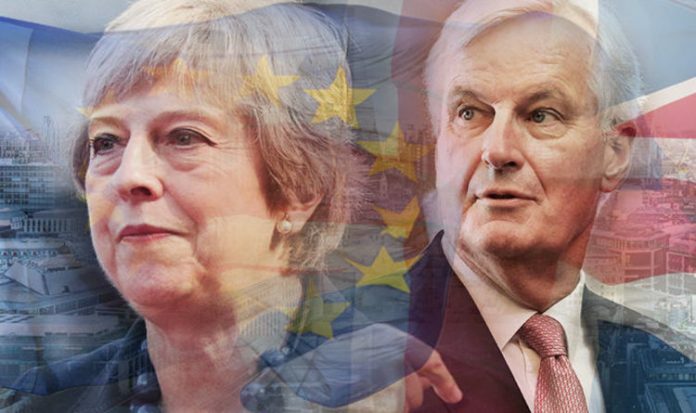 Her exhortation to her 27 counterparts to bring the negotiations to a conclusion followed speculation among EU officials that the Article 50 departure process could be extended because of the slow pace of negotiations. Downing Street sources said the Prime Minister was determined to dispel any thoughts of extension, delay or second referendum. Any deal had to be concluded in time for an expected special EU summit pencilled in for mid-November, according to officials. “This signals the fact that a very, very serious discussion is about to take place,” a senior Government official said. Mrs May delivered her ultimatum as she was given the floor at an informal summit in Salzburg to address the other 27 EU leaders about her “Chequers” plan for a future partnership for the first time. Emphasising that time was running out, she said: “We all recognise that time is short but delaying or extending these negotiations is not an option. “I know that for many of you Brexit is not something you want but it’s important to be clear there will be on second referendum in the UK. “The public has delivered its verdict and I as Prime Minister will deliver upon that – the UK will leave on the 29th of March next year. “I believe I have put forward serious and workable proposals. We will of course not agree on every detail but hopefully you will respond in kind. Mrs May also signalled her dissatisfaction with proposals floated by EU chief Brexit negotiator Michel Barnier for simplifying the so-called “Irish backstop” mechanism put forward for stop-gap customs arrangements between Northern Ireland and the Irish Republic after Brexit. The Brussels diplomat had suggested that digital technology could be deployed to check goods being shipped between the province and the UK mainland to avoid having any new border infrastructure between the two territories. Mrs May told the EU leaders: “There are two elements to tackling the unique situation in Northern Ireland. “We need a sustainable relationship that enables frictionless trade – that is at the heart of our white paper. “But we also remain fully committed to the December joint report including a legally operative protocol for Northern Ireland in the withdrawal agreement. Mrs May urged the EU to come to a deal to “maintain the deep economic ties between us that so many jobs on livelihoods across Europe depend”. She said that Europe as a whole “will be stronger and better able to cope with the threats we jointly face by keeping the UK close”. As she arrived at the summit yesterday afternoon, the Prime Minister insisted the Brexit plan set out in a Government white paper document and agreed at her Chequers country retreat was “the only credible and negotiable plan on the table that delivers no hard border in Northern Ireland and also delivers on the vote of the British people”. And she also repeated her insistence that there is no chance of a second referendum being held. “I want to be absolutely clear: this government will never accept a second referendum. The British people have voted to leave the European Union and we will be leaving on the 29th of March, 2019,” he said. Mrs May’s broadside at Brussels followed a demand from EU Council President Donald Tusk for the British proposals to be “reworked”. But he also appeared to offer hope of fresh EU concessions by insisting that Brussels’s negotiating position had to “evolve”. Warning that there was “less and less time” to reach a deal before the UK’s March 29 2019 exit date, Mr Tusk confirmed he would propose an emergency EU Brexit summit in November. “The Brexit negotiations are entering the decisive phase. He added: “On other issues such as the Irish question or the framework for economic co-operation the UK’s proposals will need to be reworked and further negotiated. Casting more doubt on the talks, EU Commission President Jean-Claude Juncker yesterday claimed a Brexit deal was still “far away”. Austrian Chancellor Sebastian Kurz, hosting yesterday’s summit, raised the alarm about the damage a collapse in the Brexit talks could do to the European economy. “We are convinced that we need a deal. We must do everything to avoid a hard Brexit. It would not just harm British, but would also cause damage for us in Europe,” he said. “We are striving to make a compromise possible. Michel Barnier is doing well, he has our full support. He has taken a step towards the British. Now we expect a willingness to compromise from the British hopefully to bring about a deal.